Every once in a while it’s nice to throw restraint to the wind. This is why molten chocolate desserts, lipstick like red patent leather, and Douglas Sirk movies exist. To me, Tom Ford Noir Pour Femme, with its over-the-top nutty sweetness, fits this category. Noir Pour Femme’s notes include mandarin, bitter orange, ginger, rose absolute, jasmine accord, orange blossom, Indian kulfi accord, Madagascar vanilla, amber, Australian sandalwood, and lentisque resinoid. (Indian kulfi is a rich, dairy-based frozen dessert; lentisque is an evergreen shrub; and a resinoid is the extract of a shrub.) Perfumer Sonia Constant developed it. Noir Pour Femme is a gourmand oriental fragrance. At its heart is a thick woody-ambery tobacco scent — whether it actually has tobacco or if it’s a play of the notes, I don’t know — wrapped in hazelnut dust and bittersweet chocolate. It’s dense and sweet. If the fragrance’s core were an object, it would be a cocoa brown velvet mattress. At the perfume’s edges are a bit of orange and a bare veil of rose and jasmine that don’t lighten the fragrance much, but that remind you that Noir Pour Femme is a perfume and not a cake. These floral notes are dwarfed by the fragrance’s whole package, though, sort of like a hippo wearing lacy socks. You see the hippo first. Within an hour on my skin, the fragrance telescopes to a woody vanilla amber with robust sillage. In the heat, Noir Pour Femme could asphyxiate an entire tram’s passengers, but in cool weather it would wear warm and silky. It lasts about five hours before I have to press my nose to my arm for a hint of vanilla. If you like Tom Ford Black Orchid except for the fruit, or if Yves Saint Laurent Opium appeals to you but you’d rather it were less spicy and more delicious, you might want to try Noir Pour Femme. Although there’s definitely a time to indulge, sometimes eating the whole molten chocolate cake or living up to the shiny red lips for an entire day is too much. Like these things, Noir Pour Femme might be best taken in small doses. It’s easy to love, but easy to overdo. This is a fragrance I’d like to have in a mini or a 10 ml decant. I’d set it next to my mini of Chopard Casmir Parfum and wait for snow. Tom Ford Noir Pour Femme Eau de Parfum is available in 30 ml ($85); 50 ml ($115); and 100 ml ($165) sizes. Angela, this sounds scrumptious! “Cocoa brown velvet mattress” — I’ve never seen such a thing, but now that you’ve conjured it, I really wish I had one. I have an unfortunate lack of self-discipline around edible scents (if you see what I mean) so I’m rather grateful that TF perfumes aren’t available in A-NZ. If they were, I suspect I’d be in like a robber’s dog, and that a full bottle would be mine by noon! I love that expression “like a robber’s dog”! I’ve never heard it. I hope you get the chance to smell this one some time. I didn’t realize that the Tom Fords weren’t available there. Or, “…like a rat up a drainpipe”? Very “down under” expressions. I have no idea why the stores here don’t carry TF. I should have thought it would be a great seller, but maybe they feel the range is too big for our tiny population. Oh, rat up a drainpipe is brilliant! ‘Disappear like a rat up a drainpipe’ is another old fashioned A/NZ expression. I modified it the other day to describe how I felt after the 24 hour flight home from Paris – ‘like a rat rejected by a drainpipe’. Oh, I love a face like a robber’s dog. I can’t believe I’d never heard it. I well understand the rat-drainpipe-brutal flight analogy, too. Waterdragon, im pretty sure all David Jones city stores have a Tom Ford counter with the full range, and Myer city stores have a smaller range. If lil ol Perth does, im guessing Sydney/melb do! Angela, I tried this and liked it except it skewed very unisex on me. Did you find it that way? I definitely thought it could be worn by any gender, but I didn’t find it overly masculine. Did it smell too masculine on you? It didn’t smell too masculine in general, just more masculine than I am comfortable with on me. I have a sample and will try it again, I do love the sweetness of it. Maybe it’s the tobacco-like smell that does that. Such a lovely review! I’ve tried Noir once on paper and don’t remember being impressed (I don’t remember much at all, to be honest), but now I must try again. I’m not sure I need a full bottle of Noir Pour Femme, but I could definitely see craving it on rare occasions. If you try it again, do let me know what you think! Great review! I was wandering about my local Nordstrom the other week and they had jars of samples of this laid out for folks to grab. I helped myself to one and confess I’ve yet to actually wear it. It’s been beastly hot, though, so maybe that’s a good thing. Perhaps I’ll wait til fall. Smart move. With a chill in the air and a cashmere sweater you might like it best. This sounds lush! Some days I want a perfume that ‘frosts’ me as is I were some divine baked goodire and this sounds just the thing. Great review! Hey, I never thought of it as olfactory frosting, but it kind of is! I haven’t tried Creme Brûlée, but I’m with you 100% on Casmir. Is frosting not too cold for this perfume? Am I missing something here? I think I may have just fallen into a cultural black hole of ignorance. I think we’re talking about the kind of frosting you put on a cake. “Icing” is another word for it. Funny–I never thought about the fact that both frosting and icing are “cold” words. Really, though, it’s just sugar and fat whipped together. Aha. I see. Yes, I know the word “icing” in the context of cakes, but not “frosting”. Good! You’ve opened my eyes, too, to these words. As delicious as an orange chocolate brownie with a side of pipe tobacco on a sandalwood platter. So glad it´s not in the super expensive range and there is a 30 ml bottle. I really want to smell this one, it sounds like my kind of thing. A 30 ml bottle is good. Really, I think half that would be perfect for me. Will try this, liked the original Noir (Pour Homme now? ), Noir Extreme not as much. Alliage and Aromatics Elixir are my go-to “too much but I love it” scents at the moment. Lovely review-will have to give it a try the next time I stop at a beauty counter. I have never fell in love with any of his fragrances. I found some to be not very long lasting on me. This one sounds like you may have to scrub it off if you don’t like it. It lasted a good long time on me, but perhaps not as long as I might have thought given the fragrance’s weight. I cannot tell if I am interested or turned off from this fragrance… but I enjoyed the review very much! That’s kind of how I felt about it once I tried it! I’m glad you enjoyed the review. My husband brought a card sample home an hour or so ago. I think it would make a deliceous candle or hair conditioner, but im not terribly tempted by it really. It really is an assertive fragrance, and I can see where not everyone would want to wear it on skin. I tried it on paper about a month ago and thought it smelled like Noir Extreme which I also like in small doses in the cold. I’ll have to try this on skin. They had all the Noirs next to each other and the SA was helping someone through the confusion. I think they should have put “pour femme” under the title. I haven’t tried Noir Extreme, and my only experience with the “pour homme” version is smelling on someone’s skin (where it smelled very nice). Nice review and perfect timing. 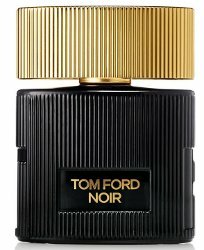 Tom Ford Noir Pour Femme is my SOTD today and yesterday and I am enjoying it a lot! I love gourmands and this is so easy to wear. I smell the fruity top notes and the creamy vanilla but not much tobacco and I couldn’t tease out any specific flowers but I know it’s there. It is also powdery. This actually reminds me of Dior Addict but without the initial harshness in Addict. I’m afraid to wear more than 3 half-spritzes because it packs a punch in the first few hours; however, it doesn’t last all that long before it turns into a vanillic / tonka-beanish dry down that is still going on 12 hours later! I am all set with a cute 30 mL bottle. Perfect! I’m glad you like it. I didn’t get much powder (for those powder-phobes) but I’m glad to hear your experience of it. Thanks! Oooh. Must not blind buy, must not blind buy, must not blind buy… Even though it has all the notes I love and when I’m alone, I can practically take a bath in Black Orchid or Angel. Angela, this sounds delicious. I’ll have to track down samples at the very least. Try a sample first! If you love it, it will still be there for you. Your very descriptive use of words allows me to visualize and smell the fragrance. I’m sure your English teachers adored you. You had me sold until I saw the word tobacco. Anything that smells like tobacco screams masculine to me. When I was a little girl, my dad always smoked a pipe. He used to take me to the tobacco store in the mall with all the time. Although I loved and still love the smells of tobacco, I don’t want to smell like one. I never thought I would say this about a TF fragrance, but I think I will pass. Thank you, and I’m glad I at least allowed you to rule it out! Do give it a smell, though, if you have the chance. Maybe the tobacco will work for you this time–or not. Hold on a sec – there’s an Indian kulfi accord?!? It’s a real thing? I don’t need the perfume, but I’d love to get my hands on this accord. I’m not sure you’d be able to suss it out of this perfume, but maybe the accord will surface somewhere else for you. I’ve never had kulfi, but after reading the description, I’d love to try it. Lisa D, L’Aromatica has a kulfi perfume. I have a sample of the oil version, and it’s great! I am tempted to buy it in the oil and alcohol-based versions. kindcrow, I’ve tried a sample of that, and I thought it was fantastic! Hey, maybe when Splitmeet comes up, we can go in on a bottle of the EdT……. For whatever reason–possibly because I’m overwhelmed by the selection–I’m never tempted to try Tom Fords (except Violet Blonde, which I liked). You made this sound so delicious, though, that I went to Sephora over my lunch break and got a sample. Noir Pour Femme is worlds away from Violet Blonde. What did you think? I actually ended up liking it. I sprayed it on paper first and it seemed like it might be too sweet for even me, but on my skin, it ended up being smoother and nuttier. Sometimes I forget I’m a huge gourmand fan, but this was instantly approachable and reminded me that sampling doesn’t always have to feel like work. Yum. It would be awful if sampling felt like work! I’m glad this one wasn’t a big fail on you. I received a bottle as a sample and was afraid a bit – Violet Blonde was really bad imho. This one (I do not need to describe it any further!) is really nice, and really fall appropraite. I even used two sprays of it – but not near my head, I sprayed it on my clothes, more on the hips sounds strange, I know! The scent develops nicely and is comfy, and is not cloying to me. This is a really good development for the regular TF brand, as this is also more affordable. Although it does not really remind of Sensuous by Estee Lauder – if you liked the latter, you might like the darker and stronger als sultrier version of it. Sorry for the typos: I mean darker, and stronger, and sultrier version. Oh, typos are so hard to avoid, especially on a small keyboard. Thank you for sharing your mini-review here! Sorry but for me this was really boring. I bought a sample from STC and was so looking forward to it but its just sweet sweet “cashmerean” woody nothing. So much like Narciso but that was good and different when it came out and I even bought a fb – only one. So I have gone back to my SL samples and am going to treat myself to another bottle of Fille en Aiguilles for the winter…at least with SL you know you’re getting masterpiece – IMHO. Filles en Aiguilles is fabulous for winter. You’ll smell terrific! When I read “If you like Tom Ford Black Orchid except for the fruit, or if Yves Saint Laurent Opium appeals to you but you’d rather it were less spicy and more delicious, you might want to try Noir Pour Femme.”, I knew I had to have it. The above fits me to a T. I’ve always had difficulties dissecting notes in TF’s perfumes. This one is no different. But it’s smooth and easy to wear for me so I don’t care. I love it. That’s fabulous! I love it when the right person finds the right perfume.